There was a time when choosing a modern fly line was a relatively simple matter because there were only three choices. Thus, all a fly angler had to do was to choose between a Double Taper, a Weight Forward Taper or, a Level fly line. Then, if an angler wanted to slow down or speed up the action of their fly rod, all they had to do was choose one line weight heavier or one line weight lighter than the rod was designed to cast. However, modern innovation has enabled fly line manufacturers to design and produce a wide range of specialty fly line tapers that were not available to fly anglers not too many years ago. For instance, viewing any major fly manufacturer’s web site (Scientific Angler’s, Cortland, Rio, Orvis, Air Flo) will present you with a bewildering array of specialty taper weight-forward fly lines and thus, simply by carrying additional fly lines on extra fly reel spools in the back of your fly vest or pack, you can now use a single fly rod for several different purposes. For instance, by purchasing one line designed to deliver an extra soft presentation and another line in a standard taper, you can cast small dry flies with a delicate presentation in the morning, then switch spools and change to the heavier line mid-morning to cast weighted nymphs or streamers, and then switch spools again in late afternoon to cast your delicate dry flies to trout rising for the evening hatch. But, in order to understand why fly lines are available in different weights and different tapers, you first need to understand how fly lines are made. Thus, all fly lines start with a thin core made from braided Dacron which has a very little stretch and, by controlling the diameter of the Dacron core, fly line manufacturers can control the tensile strength of the finished fly line. Consequently, a 1 weight fly line has a significantly thinner core than a 14 weight does and thus, less tensile strength. Next, the thin Dacron core is coated with a liquid plastic which has been infused with miniature glass balls (aka Microballoons) in order to create a floating fly line or, infused with Tungsten powder in order to create a sinking fly line. In addition, the coating of more expensive floating fly lines is also impregnated with both a hydrophobic agent and a lubricant in order to cause the line to slide through the fly rod guides with decreased friction for increased casting distance and, to cause the fly line to float higher on the surface of the water for easier pick up. The next thing that you need to understand about fly lines is how they work. Thus, unlike a conventional fisherman who depends on the weight of his lure to bend, and thus store energy in, his rod during casting, fly fisherman instead have to depend on a weighted fly line to cast their artificial flies. Of course, the reason for this is that unlike conventional fishing lures which are made from wood or hard plastic and which have large, heavy, metal hooks attached to them, artificial flies are instead made from bits of fur and feathers which are tied to very thin wire hooks and thus, artificial flies have very little weight and a tremendous amount of wind resistance. Therefore, fly fishermen have to use a weighted fly line to bend their fly rods during their back-cast so that the energy stored in the rod can be released on their forward-cast to propel their flies to their intended target. In addition, you also need to be aware that the smaller an artificial fly is, the less wind resistance it will have and, the larger it is, the more wind resistance it will have. Consequently, the smaller an artificial fly is, the lighter the fly line required to cast it and, the larger an artificial fly is, the heavier the fly line required to cast it. Thus, it is helpful to know that artificial flies range in size from 28 to 6/0 with a size 28 fly being the smallest and a size 6/0 being the largest. Also, it is helpful to know that fly lines range in weight from 1 to 14 with a 1 wt. being the lightest and a 14 wt. being the heaviest and, this is determined by weighing the first 30 feet of each line in grains (440 grains = 1 ounce). Consequently, each fly line weight has a range of fly sizes that it will comfortably cast. Thus, while you can certainly cast a very small fly with a relatively heavy fly line and, cast a very large fly with a relatively light weight fly line, casting a small fly with a heavy line will cause a heavy presentation and, casting a large fly with a light fly line will not enable you to cast the fly very far. 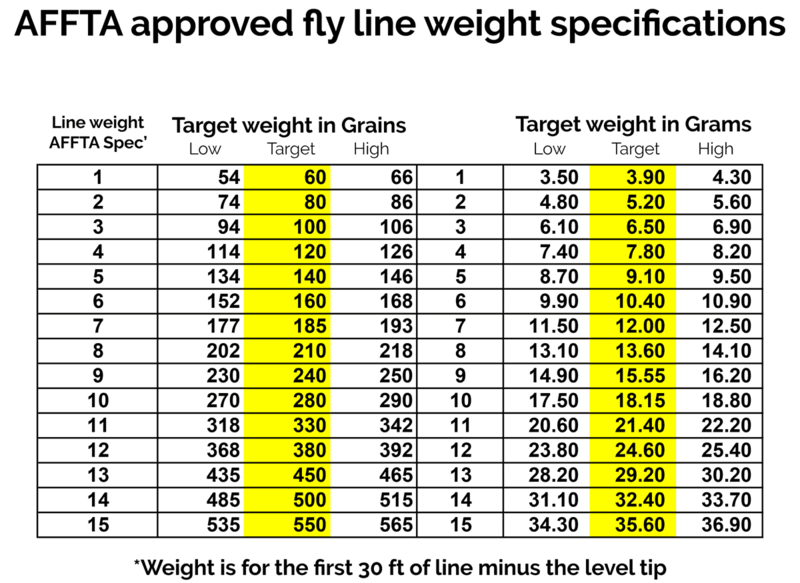 So, in order to gain an understanding of which fly sizes match with which fly line weights, use the chart below as a reference point but, do not treat it as a strict set of rules. Furthermore, in addition to being aware that each fly line weight is designed to cast a given range of fly sizes, you also need to be aware of the concept of “delicacy of presentation”. Thus, when a fly fisherman casts and lands his chosen fly in a chosen location, he is said to “present” his fly to the fish. Also, the lighter the fly line is, the less disturbance it will cause when it lands on the surface of the water and, the heavier it is, the more disturbance it will cause. Therefore, when casting to wary fish in crystal clear water, most fly fishermen prefer a lightweight fly line in order to prevent spooking the fish. But, when casting to fish in turbulent or turbid water, the delicacy of the presentation is less of a concern and thus, heavier fly lines can be used in these situations. Consequently, you will often see a given range of fly line weights recommended for certain fish species. For instance, line weights 3 through 5 are often recommended for trout, while a 7 wt. fly line is considered to be the classic fly line weight for salmon and an 8 wt. is consider to be the classic line weight for largemouth bass and pike and, a 10 wt. is often chosen for muskie. Also, the same can be said of saltwater fly lines in that an 8 wt. is considered to be the classic bonefish line weight while the 10 weight is considered to be the classic general purpose fly line weight with line weights 11 and 12 are generally preferred for Tarpon and line weights 13 and 14 reserved for pelagic fish species. However, it should also be noted that attempting to equate any given fly line weight with any given fish species is misleading at best. Thus, fly anglers should instead first determine the range of fly sizes that they intend to cast depending on the size of the fish species that they intend to pursue as well as the degree of delicacy that they require in their presentation. Then, they should choose a fly line weight that will comfortably cast that size fly while also providing them with the weight necessary to cut through any wind that they may encounter while also providing the degree of delicacy that they require. Next, we need to discuss fly line tapers which, these days, consisting of Double Tapers and Weight Forward Tapers. But, before we can discuss fly line tapers, we first need to discuss the purpose of the taper. Thus, the purpose of the taper is to transmit the energy stored in the fly rod during the back-cast to the tip of the rod during the forward-cast and, from there, to the fly line in a manner similar to that of a bullwhip. So, what is the difference between a Double Taper fly line and a Weight Forward fly line? Well, as the name implies, Double Taper fly lines have the same taper design on both ends whereas, a Weight Forward fly line is only tapered on one end and is level on the other end. Thus, both Double Taper and Weight Forward fly lines have a section called the “body” or “belly” as well as a tapered section combined with a level tip section. However, while Double Taper fly lines feature identical tapers and tips on both ends of the line, Weight Forward fly lines have both front and rear tapers which vary in both slope and length combined with a relatively short, level, tip section and, a relatively long, level, “running line”. Consequently, Double Taper fly lines are primarily designed for casting at relatively close ranges while Weight Forward fly lines are primarily designed for casting over longer ranges and, the reason this is so is that Double Taper fly lines will not “shoot” as far as Weight Forward fly lines will. However, this can be either an advantage or a disadvantage depending on your intended purpose. For instance, if you examine the diagram shown above, you will see that Double Taper fly lines lack a “running line” and thus, the body section of the fly line extends from taper to taper. Therefore, the larger diameter of this section presents more surface area to the fly rod guides which, in turn, increases the amount of friction the fly line generates as it slides through the fly rod guides as well as presenting more surface area to the air which, in turn, increases its wind resistance. But, also due to the lack of a running line, Double Taper fly lines provide fly anglers with greater control and increased accuracy when casting over longer distances because they lack the “hinge effect” that occurs where the small diameter running line meets the rear taper on a weight-forward fly line prior to transitioning into the body section. Therefore, double-taper fly lines will not shoot as far as a weight-forward fly line will due to the increased friction and wind resistance of the extended body section. However, both Double Taper and Weight Forward fly lines cast very similar to each other until the running line is reached. Weight Forward fly lines, on the other hand, are specifically designed for casting over long ranges. Thus, if you will again closely examine the diagram shown above, you will see that weight forward fly lines have a head section that is shaped very similar that of a double taper fly line which then transitions to a far more narrow section called the “running line” which is specifically designed to minimize both friction and wind resistance. Therefore, weight forward fly lines will shoot farther than double taper fly lines because, once the running line is reached, the smaller diameter of the running line creates less friction and has less wind resistance than the larger diameter of the body section of a double taper fly line. However, in order to fully understand this, you also need to understand the concept of shooing a fly line. Thus, all fly anglers employ a casting technique called “shooting” in order to extend their fly line to their desired length in order to reach their desired trout lie. 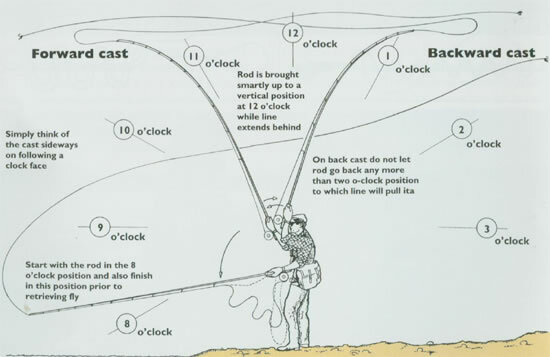 Thus, fly anglers also employ a casting technique called “false casting” during which they repeatedly cast their fly lines in the air without allowing it to fall to the water’s surface while allowing the fly line to slid forward through the fly rod guides after completing each false forward cast. However, most Weight Forward lines have a “head section” that is only about thirty feet long and thus you cannot comfortably hold any more line than the length of the head in the air when casting a Weight Forward fly line because of the hinge effect. But, since a Double Taper line has no running line section, it does not hinge so you can hold more line in the air with a Double Taper line than you can with a Weight Forward line. Conversely, you can’t shoot a Double Taper line as far as you can a Weight Forward line because of the extra friction it generates when sliding through the fly rod guides and through the air. In addition to choosing between Double Taper and Weight Forward fly lines, experienced fly anglers may choose to refine their presentation by choosing one the many different weight- forward specialty taper fly lines available because each one is specifically designed to for a given purpose. For instance, just like their classic taper cousins, most specialty taper fly lines are floating lines and, they are divided into both freshwater and saltwater specialty tapers. Therefore, there are freshwater fly lines that are specifically designed to cast small flies with an extra delicate presentation and, there are others that are specifically designed to cast large flies with no regard to presentation and, the same is true of saltwater specific tapers. Therefore, because fly anglers who fish small, crystal clear, streams require an extra delicate presentation, they can choose fly lines such as Cortland’s Spring Creek line or Rio’s Trout LT line. On the other hand, fly fishermen who commonly pursue large fish species on large creeks, rivers, ponds or, lakes using large flies can choose from such lines as Rio’s Big Nasty or Cortland’s Big Shot lines. On the other hand, those fly fishermen who commonly fish saltwater can choose from fly lines specifically designed for casting to Bonefish, Redfish, and Tarpon among others. In addition, due to the fact that fly rods with fast actions have become increasingly popular among fly fishermen these days as well as the fact that fast action fly rods require a relatively fast casting stroke, fly rod manufacturers sometimes design fly rods that are too stiff for some fly casters to fully appreciate. Thus, some fly line manufacturers have responded by producing specialty taper fly lines that are labeled as having a given weight but which are actually a half a line weight or even a full line weight heavier than the label indicates. Thus, while choosing a Double Taper fly line is relatively easy, choosing a Weight Forward fly line can be quite complicated! Then, to muddy the water even further, there are some other types of specialty taper fly lines which, unlike most specialty tapers, are designed specifically for casting over long ranges using certain types of fly rods. For instance, Switch fly lines are specifically designed to be used with Switch fly rods which generally measure 11 to 12 feet in length and which are designed to be cast with either one hand or two. In addition, there are also Spey fly rods which generally measure 13 to 15 feet in length and which are designed to be cast with two hands. Last, for fly anglers who want to cast over extremely long distances using conventional length fly rods, there are Shooting Heads which consist of a short, heavy, body section combined with a front taper and a level tip section but no rear taper or attached running line. Thus, in order to use a Shooting Head fly line, the fly angler must attach a separate “running line” to the rear of the Shooting Head in order to create an extension for fighting large fish because most shooting head fly lines measure 30 feet or less whereas, most other fly lines measure between 90 ft and 120 ft.
Then, to complicate matters even further, fly anglers must choose between floating fly lines, sinking fly lines, and sink-tip fly lines. Thus, as the name implies, a floating fly line is one that is designed to float on the water’s surface while a sinking fly line is designed to sink beneath the water’s surface and the manner in which each type of fly line is constructed is described above. Therefore, fly fishermen choose floating fly lines when fishing with artificial flies that are specifically designed to float on the water’s surface (aka Dry Flies) and sinking fly lines or sink-tip fly lines when fishing with flies that are designed to sink beneath the water’s (aka Wet Flies, Eggs, Nymphs, and Streamers). In addition, you should also be aware that sinking fly lines are available with different sink rates in order to enable fly fishermen to target fish at different water depths. For instance, they are commonly available with sink rates ranging from 1 inch per minute to 8 inches per minute. Sink-tip fly lines on the other hand, combine a floating line with a sinking fly line and they are available with sinking tips than range from 5 feet to 15 feet. Thus, the purpose of a sink-tip fly line is to enable a fly fisherman to suspend their fly just a few inches beneath the water’s surface while also making the line easier to pick up off of the water’s surface when starting the back-cast. Therefore, they are an excellent choice when fishing with wet flies or streamers. 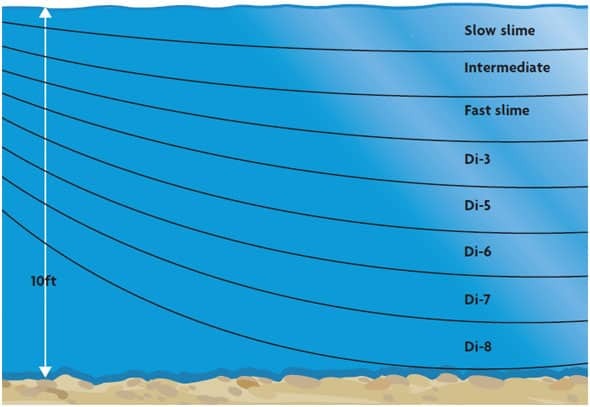 Next, you need to be aware that all fly lines are first designated by the type of taper they have and then, they are further designated by their weight and last, they are designated as either Floating (aka “F”) fly lines or Sinking (aka “I” for intermediate) fly lines. How do Freshwater vs. Saltwater Fly Line Weights Equate? 2 wt. = 6 wt. 3 wt. = 7 wt. 4 wt. = 8 wt. 5 wt. = 9 wt. 6 wt. = 10 wt. Therefore, choosing a 6 wt. fly rod for saltwater use is like choosing a 2 wt. fly rod for freshwater use because both fly line weights (and thus both fly rods) would be considered ultralights for their respective environments and thus, they would provide extra delicate presentations. On the other hand, choosing a 10 wt. fly rod for saltwater use is like choosing a 6 wt. fly rod for freshwater use knowing that by moving to a heavier fly line, you will be sacrificing delicacy of presentation in exchange for casting distance as well as wind and fish fighting power. So, as you can see, with so many different types of fly lines on the market today, the process of choosing a fly line is no longer a simple matter. Thus, while fly line manufacturers have certainly done fly fishermen a service by producing and refining so many different types of fly lines, they have also done them a disservice by offering so many different choices that it is sometimes difficult to choose the best fly line for any intended purpose. Therefore, rather than allowing yourself to become confused and thus, get bogged down in the process of choosing the best fly line for your intended purpose, you should instead focus on deciding whether you need a floating fly line, a sinking fly line, or a sink-tip fly line based on the type of flies that you intend to fish with. From there, you need to choose an appropriate fly line weight while also considering the range of fly sizes that you intend to cast as well as the degree of delicacy that you require in your presentation. Then, once you have determined the proper type of fly line and an appropriate fly line weight, you can then progress to choosing one of the many different specialty tapers on the market which best suite your needs. Bill Bernhardt, is the owner of, and guide and instructor for, Harper Creek Fly Fishing Company (www.nc-flyfishing.com) located in Lenoir, North Carolina. As a fly fishing guide, Bill is somewhat unusual in that he specializes in small streams, wild trout, and backcountry, remote access, walk/wade trips in the Blue Ridge Mountains. In addition, he is also a professional freelance outdoor writer and an official contributor to Southern Trout online fly fishing magazine as well as the author of nine books which are published on Amazon Kindle.